Little things. We knitters have lots of little things. Stitch markers, crochet hooks, darning needles, measuring tapes… the list goes on. These are the kinds of things that you can never have too many of. Julia wrote a great piece about her tool kit, here. And I wrote a pretty OK piece about my bug out bag, here. 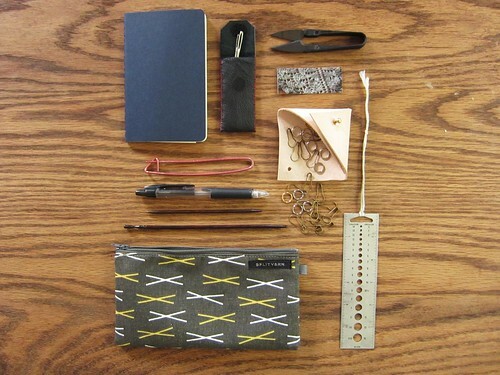 Bring these lists in to the store, ask our killer staff to put together a kit for your budding knitting, or have them pick out some really nice tools to replace old worn ones (why yes, I will take that handmade rosewood crochet hook over my old, bent, flaking steel one, thank you very much). This will be more appreciated than you can imagine – it’s the little things. And for today’s pattern suggestion: Lumberjack, from Tin Can Knits (they always have such lovely patterns, don’t you think?) I don’t know why, but I am suuuuuper into the idea of a whole family’s worth of these! And for yarn… well, any DK or light worsted, so… uh, go nuts. This entry was posted on Friday, December 19th, 2014 at 10:58 am	and is filed under Advent. You can follow any responses to this entry through the RSS 2.0 feed. Both comments and pings are currently closed.